I have a Templates document library, where the piece of code below has happily forcing the download of a template document instead of the file been opened. However, it has stopped working. The reason for needing to force download is that users actually need a copy of the template and don't need to open the actual original template. (There is an approval workflow, as part of a QMS, which manages the templates and tracks the version, users accidentally interfere with this otherwise). n.b. there is a Templates Editors group for certain users who have permission to edit the templates in order to keep them updated. For everyone else -> force download. Following Ahmad's suggestion to check the Console - there is a warning of 'deprecation' - it appears that my custom .js code is being ignored by the browser somehow. I've never seen this happen before, but I also didn't know the console existed (so what do I know...). I did a search on the warning message and found this popular link. Possibly the code needs to load via AJAX instead of in the Style Library? There are quite a few Answers in this post, but a lot of it I don't understand, since I am a humble SP Admin who only dabbles in modifying & reusing existing code. The deprecation message is caused by the async: false in your SPServices call. You should be able to perform that query asynchronously (change to async: true) without issues, as you are correctly using the completefunc callback already. The message should then disappear - but it also shouldn't be the cause of your issue, as a deprecation typically means that something is still functional, but should not be used anymore because of performance issues or being removed in future versions of the software. 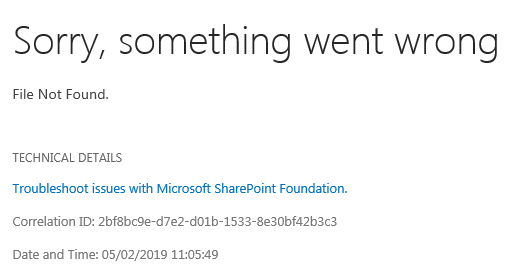 If the problem does not occur with every document (I was not able to determine whether that's the case), but only with those with special characters in the name, it is possible that encoding the URL parameter solves the issue. This should be done nonetheless to prevent additional problems coming from umlauts etc. Am I right in thinking that the documents are also all in a library within the /uk_qhse subsite?